MILES MCENERY GALLERY presents an exhibition of works by WOLF KHAN, on view at 525 West 22nd Street. The exhibition is accompanied by a fully illustrated catalogue, featuring an essay by Martica Sawin. Including paintings dating from the 1960s as well as a selection of recent works, this exhibition illustrates the evolution of Wolf Kahn’s prolific career and his continuing exploration of the relationships between color and form. Wolf Kahn’s earlier, more densely painted canvases often feature darker, tonal hues, while his works from the late ‘60s represent a transition to an increasingly vivid palette. Illuminated by brilliant bands of color, his vigorously painted landscapes possess a captivating rhythm and alluring vibrancy. By juxtaposing bolds tones with the muted shades of the natural world, Wolf Kahn produces a kind of contrast that energizes the surface of the canvas while simultaneously creating a sense of balance. After decades of painting, Wolf Kahn’s masterful use of color remains his primary subject. WOLF KAHN was born in Stuttgart, Germany, in 1927. He immigrated to the United States by way of England in1940. In 1945, he graduated from the High School of Music & Art in New York, after which he spent time in the Navy. Under the GI Bill, he studied with renowned teacher and Abstract Expressionist painter Hans Hofmann, later becoming Hofmann’s studio assistant. In 1950, he enrolled in the University of Chicago, and graduated in 1951 with a Bachelor of Arts degree. After completing his degree in only one year, Wolf Kahn decided to return to being a full-time artist. He and other former Hofmannstudents established the Hansa Gallery, a cooperative gallery where Kahn had his rst solo exhibition. In 1956, he joined the GraceBorgenicht Gallery, where he exhibited regularly until 1995. Kahn has received a Fulbright Scholarship, a John Simon Guggenheim Fellowship, an Award in Art from the Academy of Arts and Letters, and a Medal of Arts from the U.S. State Department. Traveling extensively, he has painted landscapes in Egypt, Greece, Hawaii, Italy, Kenya, Maine, Mexico, and New Mexico. He spends his summers and autumns in Vermont on a hillside farm, which he and his wife, the painter Emily Mason, have owned since 1968, but his primary residence is in New York City. 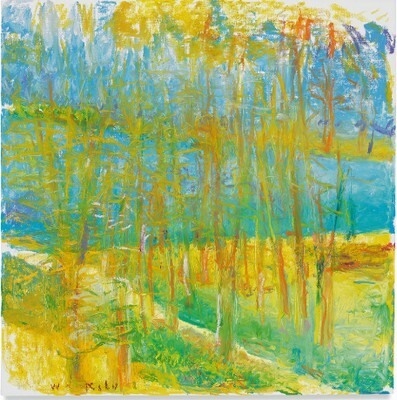 Wolf Kahn’s work is set apart by his masterful synthesis of artistic traits—the modern abstract training of Hans Hofmann, the palette of Matisse, Rothko’s sweeping bands of color, the atmospheric qualities of American Impressionism. The fusion of color, spontaneity and representation has produced a rich and expressive body of work.